The mission of the New York Museum of Transportation is to collect, preserve, display, interpret, and operate artifacts and information from the transportation history of Upstate New York and surrounding area, to delight, inform and educate our visitors about their transportation heritage. This volunteer organization is chartered by the Board of Regents of the University of the State of New York as a non-profit, 501(c)(3) educational institution, and gratefully accepts tax-deductible monetary donations and contributions of vehicles, artifacts, photographs and paper goods pertaining to transportation history. Just 20 minutes south of Rochester is a experience of fun and history sure to please everyone in the family from youngsters to old-timers. With rolling hills and the Genesee River valley as a backdrop, the only trolley ride in New York State brings back the era of interurban trolley travel in all its glory. 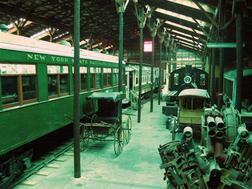 This interesting and educational experience highlights the transportation history of our part of New York State. The New York Museum of Transportation houses fourteen full size trolley cars, a caboose, steam locomotive, antique highway and horse-drawn vehicles, and the various associated smaller items that illuminate our transportation history. 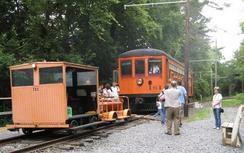 An 11' x 21' HO-gauge model railroad operates five trains and two trolleys at one time. Pump-type handcars, track inspection velocipede, signs, baggage carts, diesel engine cutaways, cap badges, track tools and lots of other artifacts complement the many photo exhibits and interpretive displays. The Gallery features a rare color film of the Rochester Subway. A big hit with visitors is the trolley car from the Spaghetti Warehouse Restaurant, open for display. The visitor Center contains a display of "O" gauge models of trolley cars that once served the area, and the exquisite modules by Donovan Shilling recreate moments in time from the turn of the last century. Your half-hour excursion on the only trolley ride in New York State is aboard one of the museum's 87-year-old trolley cars. You'll hear the clickety-clack on the rail joints and toots from the air whistle at grade crossings, as you travel to Midway Station. There, the Conductor will reverse the poles on the car for the return trip through the beautiful Genesee Valley countryside. 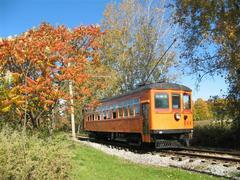 Trolley rides operate mid-May through October, from 11 a.m. to 4:00 p.m., Sundays only. Weekday group visits are available throughout this period by prior arrangement. Our History: The New York Museum of Transportation was formed in the early-1970's, to provide a home for Rochester-area trolleys that had been orphaned with the demise of a private museum in Pennsylvania. 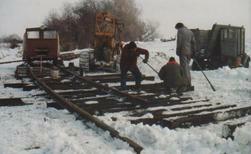 Arrangements were made to occupy our buildings, Rochester & Eastern interurban trolley 157 was brought to the site, and a volunteer corps began to assemble. Our New York State charter as a non-profit educational institution was obtained in 1975. Through the late 1970's, rail and ties were salvaged from the former Rochester Subway, and a Federal job-training grant helped us complete the track that loops around the building and heads to the southwest. More vehicles were added to the collection, and an archive of photos and documents was started. For the visiting public, exhibits and a gallery were created and a comfortable visitor center completed. In the summer of 1980, the museum began offering the unique track car rides that continue to be a popular attraction during the summer months. Throughout the 1980's, museum volunteers worked on restoration projects, visitor operations, archive housing and cataloguing, and special transportation history projects. The number of vehicles and artifacts in the collection grew, and the quality of the "hands-on" visitor experience grew with them. 1996 brought the museum many exciting new things. A rare and beautifully preserved interurban trolley car formerly used inside a local restaurant was acquired. 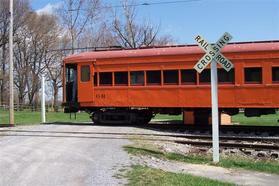 Two fully-operational trolley cars, dating back to the late 1920's, were obtained shortly after. And, as the first of these two cars arrived at the museum, the first pole was placed in the electrification of the museums' rail line. 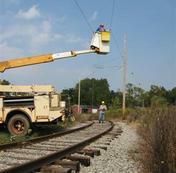 Throughout the late 1990's, volunteers designed and constructed the pole line and installed the overhead wire. After a series of test runs, the first public trolley rides in the Rochester area since 1956 were run on June 30 and July 1, 2001. With the inauguration of regular trolley service on July 15, 2006, the museum fulfilled a dream that had been a part of us since our inception over 30 years ago. But the work goes on and progress keeps getting made. Further extension of the electrified portion of the rail line to a full mile in length now offers a true interurban trolley experience as the big car rumbles along through scenic Genesee Valley countryside. Our growth continues, and you are invited to be a part of it...as a member and as a volunteer. Join us, and be part of the fun and the fulfillment of our mission!